In this tutorial, you will learn about Facebook’s Flux architecture and how it’s used to handle the data flow in React-based applications. We’ll begin by covering the basics of Flux and understanding the motivation behind its development, and then we'll practice what we’ve learned by building a simple virtual wallet application. Throughout the tutorial, I will assume you’ve used React before, but have no experience with Flux. You might get something out of it if you already know the basics of Flux and are looking to gain a deeper understanding. If you are completely new to the React scene, I recommend going through the Getting Started With React course by David East, here on Envato Tuts+. It's a fantastic course that will get you up to speed in no time. Flux is mainly an application architecture concept developed by Facebook, but the same term also refers to a library that represents the official implementation. Facebook came out with Flux as an attempt to solve the problems caused by the MVC pattern in their massive codebase. They struggled with issues where actions triggered cascading updates that led to unpredictable results and code that was hard to debug. This may sound familiar if you’ve used MVC frameworks before, as in most of them everything tends to be tightly coupled. Add watchers and two-way data binding to the mix, and you’ve got yourself a proper headache. My advice is to avoid any attempt at finding common ground between Flux and MVC. It won’t help much, other than amping up your confusion. Flux attempts to solve things differently, and trying to compare it with other patterns won’t help. If you'd like to follow along with the tutorial, first make sure you have the required software installed. When you have finished, clone the boilerplate branch from the GitHub repository I prepared to accompany this article. In order to install all the required dependencies, cd into the project directory and run yarn. In the next section, you will be setting up the application’s core components before integrating Flux. I haven’t included them in the boilerplate as I believe it would create more confusion. If you’re not interested in building the app, you can skip these steps and jump to the next section. // Set the initial state. // Return a fresh item. // If the amount is changed and it's not a float, return. // Show a friendly message instead if there are no items. That’s it! You’re done setting up the project’s components. The great part is that they also come with free styling. Run yarn start and wait for the bundle to build. If you point your browser to localhost:8080, you should see the app without any functionality. Next, we’ll cover what Flux is and how you can use it to add functionality to the virtual wallet application. Actions describe an action that took place in the application. The dispatcher is a singleton registry of callbacks. It acts as a middleman by passing the actions to all the stores that subscribed to it. Stores manage the state and logic needed to update it for specific parts of the application. Views are plain old React components. Actions are passed to the dispatcher using convenience classes called action creators. The dispatcher sends (is dispatching) the actions to all the stores that subscribed to it. Finally, if the stores care about a particular action that was received (or more), they update their state and signal the views so they can re-render. Below is a visual representation of this process. payload: "This is a new title." The action’s type must be represented by a descriptive and consistent uppercase string—similar to the common convention of defining constants. They serve as unique IDs that stores will use to identify the action and respond accordingly. A common practice is to define all action types in a constants object and reference that object instead across the application to maintain consistency. Our virtual wallet will support a single action, which adds items to the list—both expenses and financial gains will be treated as a single item—so our constants file will be very slim. Actions are passed to the dispatcher using convenience class helpers called action creators that handle the simple task of creating and sending the action to the dispatcher. Before creating our action creator, let’s see what the dispatcher does first and understand its role in Flux. The dispatcher is used to coordinate the communication between action creators and stores. You can use it to register a store’s actions handler callback and also to dispatch actions to the stores that subscribed. register(): Registers a store’s action handler callback. unregister() : Unregisters a store’s callback. waitFor(): Waits for the specified callback(s) to run first. isDispatching(): Checks if the dispatcher is currently dispatching an action. The most important are register() and dispatch() as they’re used to handle most of the core functionality. Let’s see how they look and work behind the scenes. // Register a store callback. This is, of course, the basic gist. The register() method stores all callbacks in a private _callbacks array and dispatch() iterates and calls each callback stored using the received action. For simplicity, we won’t write our own dispatcher. Instead, we’ll use the one provided in Facebook’s library. I encourage you to check out Facebook’s GitHub repo and see how it’s implemented. It imports the dispatcher from the flux library—which was installed using yarn earlier—and then exports a new instance of it. // Note: This is usually a good place to do API calls. It receives an item as an argument. It uses the dispatcher to dispatch an action with the ADD_NEW_ITEM action type we created earlier. It then sends the received item as payload along with the action type. Before putting this action creator to use, let’s see what stores are and how they fit in our Flux-powered application. I know, I said you shouldn’t compare Flux with other patterns, but Flux stores are in a way similar to models in MVC. Their role is to handle the logic and store the state for a particular top-level component in your application. All Flux stores must define an action handler method that will then be registered with the dispatcher. This callback function mainly consists of a switch statement on the received action type. If a specific action type is met, it acts accordingly and updates the local state. Finally, the store broadcasts an event to signal the views about the updated state so they can update accordingly. In order to broadcast events, stores need to extend an event emitter’s logic. There are various event emitter libraries available, but the most common solution is to use Node’s event emitter. For a simple app like a virtual wallet, there’s no need for more than one store. // Registers action handler with the Dispatcher. // Switches over the action's type when an action is dispatched. // Adds a new item to the list and emits a CHANGED event. // Returns the current store's state. // Calculate the total budget. // Hooks a React component's callback to the CHANGED event. // Removes the listener from the CHANGED event. We start by importing the required dependencies needed for the store, beginning with Node's event emitter, the dispatcher followed by the ActionTypes. You will notice that below it, there is a constant CHANGE, similar to the action types you learned about earlier. It’s actually not one, and it shouldn't be confused. It's a constant used for the event trigger when the store's data change. We will keep it in this file as it isn't a value used in other parts of the application. When initialized, the WalletStore class starts by registering the _registerToAction() callback with the dispatcher. Behind the scenes, this callback will be added to the dispatcher's _callbacks array. The method has a single switch statement over the action's type received from the dispatcher when an action is dispatched. If it meets the ADD_NEW_ITEM action type, it then runs the _addNewItem() method and passes along the payload it received. The _addNewItem() function sets an id for the item, pushes it to the list of existing items, and then emits a CHANGE event. Next, the getAllItems() and getTotalBudget() methods are basic getters, which we’ll use to retrieve the current store's state and the total budget. The final two methods, addChangeListener() and removeChangeListener(), will be used to link the React components to the WalletStore so they get notified when the store's data change. Using React allows us to break down parts of the application into various components. We can nest them and build interesting hierarchies that form working elements in our page. In Flux, components located at the top of the chain tend to store most of the logic needed to generate actions and receive new data; therefore, they are called controller views. These views are directly hooked into stores and are listening for the change events triggered when the stores are updated. When this happens, controller views call the setState method, which triggers the render() method to run and update the view and send data to child components through props. From there, React and the Virtual DOM do their magic and update the DOM as efficiently as possible. Our app is simple enough and does not respect this rule by the book. However, depending on complexity, larger apps can sometimes require multiple controller views with nested sub-components for the major parts of the application. We’ve finished covering the major parts of Flux, but the virtual wallet app is not yet completed. In this last section, we’ll review the entire flow from actions to views and fill in the missing code needed to complete Flux’s unidirectional data flow. Getting back to the <AddNewItem /> component, you can now include the WalletActions module and use it to generate a new action in the _addNewItem() method. Now, when the form is submitted, an action is dispatched and all stores—one in our case—are notified about the new data. In your WalletStore, currently when an item is added to the list its state changes and the CHANGE event is triggered, yet no one is listening. Let’s close the loop by adding a change listener inside the <ItemsList /> component. The WalletStore module is included at the top. The initial state is updated to use the store's state instead. A new _onChange() method is used to update the state with the new data from the store. Using React's lifecycle hooks, the _onChange() callback is added and removed as the store's change listener callback. Congrats! 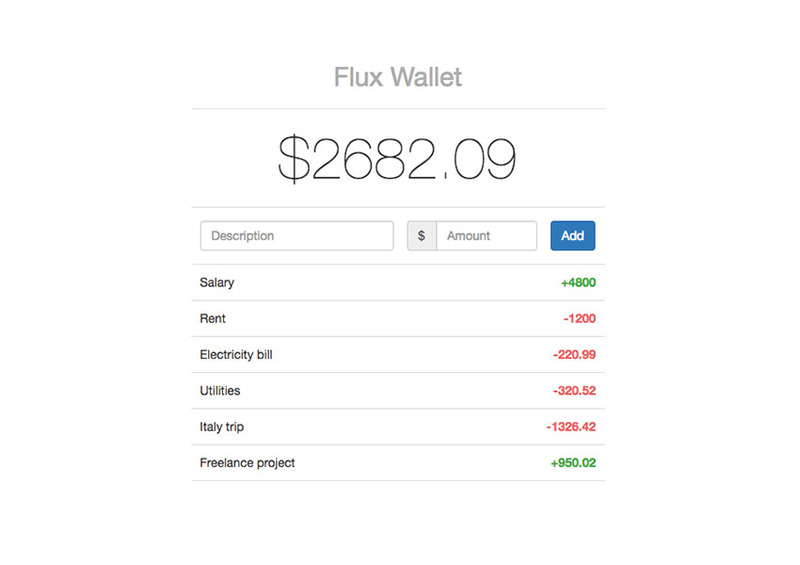 You’ve finished building a working virtual wallet app powered by Flux. You’ve learned how all the Flux components interact with each other and how you can add structure to React apps using it. When you’re feeling confident in your Flux skills, make sure you also check out other Flux implementations like Alt, Delorean, Flummox or Fluxxor and see which one feels right for you. Let me know your thoughts in the comments below, I'd love to know what you think about Flux or assist if you're having difficulties following the tutorial. If you'd like, you can also reach me on Twitter @hiskio.